A group that identifies with the concept of the team. A team that brings together Italian-made excellence and exports it to more than 110 countries the world. With its distinctive new trademark, Fiandre underlines the evolution of a story that has represented innovation and tradition for more than 50 years in a recognisable symbol reborn in the company’s new brand, to preserve its history and roots. Right from the very start, Fiandre was strongly motivated towards its connotation as an innovative company, with high technological content and forward-looking vision. It was the first of the companies in the industry to believe in porcelain tile and in a 20x20 cm format, which was considered remarkable in the 1960s. It continued with undeniable success along a path marked by victory, consolidating its business in all the markets acquired over the years, creating a widespread network of showrooms which became leading-edge examples for the world of architecture. A key account sector was developed, enabling the company to communicate and grow in the presence of Italian leaders such as Ferrari, Fendi, Fiat and Armani, and to introduce Italian tradition to foreign giants like Dior, Jaguar, Givenchy and Nike. Its commitment originated from 50 years’ history, during which quality, skill and innovation went hand in hand, bringing the company into a predominant market position. Its constant attention to environmental issues is the social commitment that distinguishes Fiandre in its goal, thanks to detailed and constant research, in order to design and create excellent products using purer raw materials, the same that give life to quarry materials like marble, granite and ancient stone, inspirations of Fiandre’s leading-edge collections. The pureness of the raw materials, along with the most advanced technology and continuous study of the aesthetic trends and advanced design, is a guarantee of long-lasting results. Constant updating of the technological tools available to the company is what enables it to best protect the surrounding environment from the harmful effects of industrialisation. Its attention to new opportunities has allowed Fiandre to launch advanced products that respond to all the requirements of the market and the company's varied clientele. Fiandre is making its entry into the future, in its "second" 50 years of history, following the natural evolution of this path with the launch of a new generation ceramic, both with the revolution represented by the eco-active materials Active Clean Air & Antibacterial Ceramic™, which enrich Fiandre slabs with bactericidal and anti-pollution characteristics, and with the creation of the Maximum collection, which focuses on a new extraordinary format, the largest ever made. 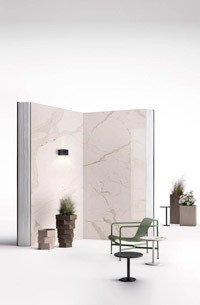 With a generous surface area of 4.5 m2, each 300x150 cm slab is evidence of the evolution of a material that can now respond to the requirements of a design world that is constantly developing. An exceptional step forwards for a global company, with a presence throughout the world and that fully satisfies the requirements of its varied clientele. A versatile company that guarantees a significant presence in the USA, central Europe and worldwide thanks to select, highly specialist retailers: this is Fiandre Architectural Surfaces.